In the past, Lisa Morris self-medicated to help numb her pain. 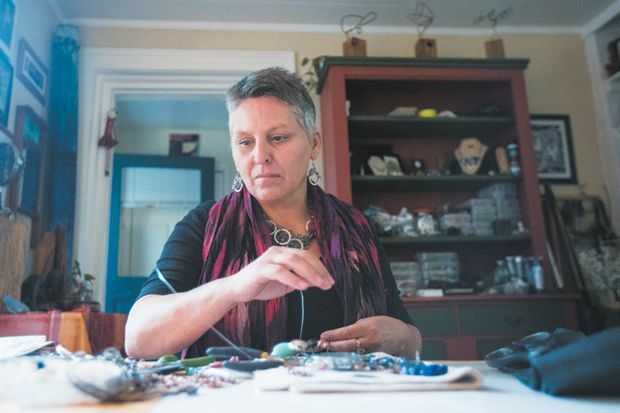 With help from Belleville’s Primary Care Low Back Pain program, Morris’s life has done a 180: she’s self-employed as an artist, sleeping well and has given up pain pills. When Lisa Morris describes her first visit to the Nurse Practitioner-Led Clinic (NPLC) in Belleville, Ont., 10 years ago, she admits she was a physical and emotional mess. Years of abuse going back to her childhood and at the hands of her ex-husband had taken their toll, and Morris was medicating her pain away. Calling the clinic “an absolute saviour,” Morris says her life has done a complete 180 since then. She’s now remarried, a self-employed artist and has given up pain pills. While Morris found support to help her on the road to health, there are hundreds of thousands of Canadians caught up in today’s opioid crisis who haven’t been so lucky. Opioids — such as oxycodone, hydromorphone and fentanyl — are natural or synthetic drugs used to reduce pain. While they can be an effective tool for short-term pain management for some patients, they often carry risks and do more harm than good for many others. Opioids provide little to no difference in pain management compared to non-opioid medications, such as Tylenol or Advil. According to The Journal of the American Medical Association (JAMA), evidence shows that as the dosage of opioids increases, they still only provide minimal effects on chronic pain, which demonstrates that the side effects outweigh the benefits. Canada is the second-highest consumer of prescription opioids in the world, after the U.S., and opioid-related overdoses and deaths have skyrocketed in recent years. Back pain is the most common diagnosis for opioid prescriptions by both emergency and family physicians, according to a study published in The Canadian Medical Association Journal (CMAJ). For a long time, the public health system relied on opioids as an affordable first option to treat pain. However, things are changing as awareness grows. The 2017 Canadian Guideline for Opioids for Chronic Non-Cancer Pain recommends that opioids should not be the first choice for chronic, non-cancer-related pain. Instead, health care practitioners should consider non-drug options, such as chiropractic care, physiotherapy and massage therapy. Patients and health care providers are now looking to optimize non-opioid and non-drug therapies but face limitations when considering their options. Although initially hesitant to pursue chiropractic care, Morris joined Belleville NPLC’s Primary Care Low Back Pain program, launched in 2015 by the Ontario government. Belleville NPLC is one of seven Ontario locations chosen to offer patients with low back pain access to funded treatment from chiropractors, physiotherapists or kinesiologists. Morris ended up seeing Dr. Flynn, a chiropractor with over 40 years of experience. She says he asked questions and listened, as did the other professionals at Belleville NPLC. He also gave her a new way to look at her pain: as a helpful guide rather than the enemy. “When people come to see me, I’m trying to get them to understand that they don’t necessarily have to turn to medication,” he says. Karen Clayton-Roberts, clinic director at Belleville NPLC and a nurse practitioner, says the collaborative team approach to addressing acute and chronic low back pain not only helps patients who are already addicted to opioids, but can keep others from being prescribed opioids in the first place. “The key is access — and to get them the care as soon as possible. Because the longer you wait, the more likely the patient will go to medication,” she says, adding that if patients aren’t able to see Dr. Flynn that day, they can usually get in within 48 hours. The results of the program highlight the success of non-drug therapies and their ability to reduce the need to use pain killers. Of the 146 patients surveyed, 83 per cent indicate they now rely less on medication to help manage their low back pain. With this success, it’s no wonder the Ministry of Health and Long-term Care has provided funding to keep the Primary Care Low Back Pain program running in Belleville and at the other six sites. Both Dr. Flynn and Lisa Morris hope the Ontario government will fund the Primary Care Low Back Pain program at other sites beyond the first seven to help people across the province.